AT Gardare is a Joomla! template tailored for garden design or garden care template website. This template built help you have the ability to build a bespoke site that is visually appealing and highly professional. 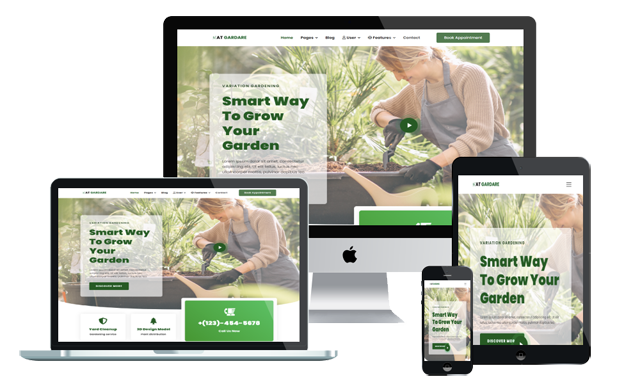 You have a garden related business that you have put a great deal of effort into building, and you recognize that in current entrepreneurial climate a website that compliments your business is an essential. The gallery feature will enable you to display your garden designs and work that you’ve already undertaken, given potential customers a good idea of your skills and capability. If you have already built a brand identity, then you will be able to transfer this to your website by changing colors to create a site that matches your business. Your template will also benefit from cross browser compatibility and fully responsive design, meaning your site can be displayed to all your visitors, no matter what device or browser they’re using. Make your sites displaying on all mobile devices with 100% responsive layout. Besides, it builds on powerful framework with completely Bootstrap CSS Framework, Support Font Awesome and K2 extended style. Furthermore, it also comes with 4 colors schemes and boxed layout helping to create elegant websites with various layouts. When you use our Garden Joomla template really can have a great website that increases your business and broadens your reputation.